A game's beginning is important, so why is it so hard to get it right? Winter always seems to drag on forever, like a meeting with lots of boring graphs but no biscuits, or a train ride with no internet. But now we segue into the slightly-less-terrible season that is Spring, the season that's all about new beginnings - from baby lambs being splooshed out of their sheepy mothers to the flowers blooming prettily on the side of the motorway. Ah, Spring. And if there's one thing I love about video games, it's their beginnings. That moment when you first Press Start - when your expectations are at their highest and your excitement is building and building as the screen slowly fades in to reveal… you. A video game has a lot of admin to sort out in those first few moments: What's your name? Who are you? Are you a boy or a girl? What colour is your hair? All very important questions, but it's not exactly gripping stuff. Imagine settling into a film in the cinema, and being bombarded with personal information rather than the punchy, bombastic openings we're used to. "Hello! My name is The Terminator, and I like to terminate people. With guns. My birthday is in June and my favorite color is pink…"
That's why a lot of games get some of it out of the way in menus. Think back to Ocarina of Time: the start screen lured you in with its soft ocarina melody, the horse and rider galloping silhouetted across the field, the moon rising slowly in the background. It told you very little about the game or the story, but it worked wonderfully. Zelda games are perfect examples of great beginnings, but a definite exception to the rule - they almost always begin with a big expository story. "A long time ago…" written in text isn't usually a strong start to a visual medium that relies on player input, and if we're being honest, the actual story behind Zelda isn't all that relevant to your experience. A bad man stole a triangle a long time ago? Okay, great. Am I going to get the triangle? No? Oh. Right then. But still, that short little story at the beginning sets the scene for a series that's turned from charming fantasy RPG into a full-blown, complicated epic. Mario stories start with a lot less: a letter from a Princess, and an air-drop into somewhere terrorized by Bowser. You don't need much introduction with Bowser: his very design screams "Bad Guy", and his characteristic bwa-ha-ha-ha and tendency to kidnap people only cements him as your antagonist. There, in just a few short moments of screen time, is all you need to know. Other games have taken a different approach. Like the ones that explain away the expository aspects with some sort of memory loss, like Fallout New Vegas and BioShock. Or the ones that disorientate you to put you in the main character's shoes, like Half-Life 2, with its unsettling close-up and monologue from G-Man. Some of the most memorable are the most cinematic: Shadow of the Colossus' slow, beautifully-scored entrance, for example, among many others. But just as books all have different styles of beginning, from the direct imperative of "Call me Ishmael" to the rather more meandering "It is a truth universally acknowledged…", games also have different ways of addressing the player, and different ways of incorporating game mechanics into what would otherwise be a straightforward story. People you've never met come up to you and start gabbling about "pressing A" and "opening the menu" - and it's all very confusing, because there's never any explanation about why these people know anything about the metagame. Tutorials are a necessary evil, of course, but the majority are clunky and immersion-breaking, like having someone explain the rules of a sport before you're even allowed to watch it. Given that games are getting more and more complicated as technology advances, and that means going from the old days of "Press A to jump" to the modern setup of "Press A to jump, B to do a mid-air twirl and flick the analog stick gently to the left to reload", you're going to need a tutorial if you don't want to be That Person running into walls the whole time. But - what if you've played the game before? What if you want to skip the super-slow lesson and get stuck into the shooting, or jumping or farming? Well, nine times out of ten, you can't. Tough luck. Alternatively, you could always just have pop-ups that tell you how to play, right? Little informative bubbles that say things like "Did you know you can press X to do the thing", so that you don't have to make your NPCs creepily omniscient. But then, you know, you have pop-ups, and everyone hates pop-ups. Back in the day we used to have manuals, and people would read them, and we didn't have to have pop-ups, but now no-one reads any more and trees are extinct, so, pop-ups. There really isn't a perfect way to do a beginning - you can have all the dramatic tension and music and beautiful cinematic visuals, but you're still going to have to instruct as well as entertain, or your "hero" is going to be a bumbling idiot who can't remember how to jump. Games are a developing medium that want to be like (but can never be) films. Films don't have buttons. 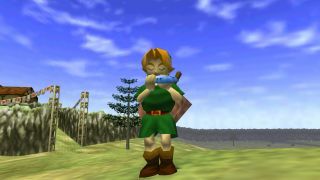 As for me, I'll spend Easter thinking on that Ocarina of Time intro, with the sound of a soft gallop over the gentle, pastoral melody, lulling you into a false sense of security before you find out that the game has screaming hump-zombies. Ahhh.